Well isn't this a pleasant surprise! I should explain: I have been struggling for quite awhile with the Chronicles of Narnia Series. Having not gone to an English speaking school, I never read them growing up. I have to admit I discovered the film version of The Lion, The Witch and The Wardrobe first. After falling in love with that film, I attempted to read the series, starting with The Lion, The Witch and The Wardrobe (which was the first Narnia book to be published), but at that time, I had a hard time with author C.S.Lewis' style. He tends to constantly insert the author’s voice, and I found it broke the fantasy bubble for me and kept taking me out of the story. 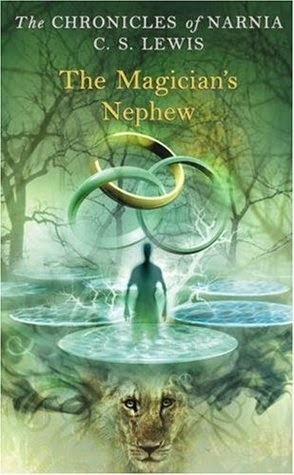 This time around, I begun with 'The Magician's Nephew', reading the story chronologically instead of by order of release. It might be because this time, I don't have the film version to taint my opinion, but I very much enjoyed this book. The Magician's Nephew is the tale of how Narnia came into being. It takes place many hundreds of years before the events of 'The Lion, The Witch & The Wardrobe'. I found that whole aspect of it to be really fascinating -especially since one of the main characters is the old Professor who takes in the Pevensie children in TLTW&TW (the one who owns the infamous wardrobe)! You get to see the creation of Narnia, meet Aslan, and see how the evil White Witch came to Narnia. The idea of witnessing a world just beginning.... hardly any people, few animals... seeing places with no names; all of this was really fascinating to me. Then again, I've always been a sucker for a good origins story.